There are some great stories when it comes to the evolution of the lift. There was Elisha Otis who ceremoniously (and sensationally) had the lift cable cut while he was in the lift to prove his new brake system worked. Or the fact the lift shaft was actually invented 4 years before the first modern lift. More poignantly, the lift (or elevator in American-speak) enabled taller buildings and denser cities which some argue has led to a fatter populace. Archimedes’ screw is the precursor of lifts, using technology to lift up, or elevate, items efficiently. And as technology boomed, so too the height of buildings. There are a dizzying array of types of lifts now, and their presence is being felt even inside our homes. To get more people up faster, there are double decker lifts (no triples as yet) as well as sky lobbies so that occupants need to change lifts to go higher. The limited height of lifts enables 3-stage buildings which are a conglomerate of dumped buildings on top of each other in order to reach ever higher (hotels on residential on commercial). Buildings have now been restricted (more-or-less) by the current cable technology – it is not hard to imagine how heavy the cables are. Steel cables (called ropes) account for around 3/4 of the moving mass. The larger the travel distance, the longer the ropes, the heavier the mass, the larger the motor, and the more expensive it is. And counterweights only do so much. Eventually, steel could snap under such loads. On 22 May 2013 works commenced on site on the Kingdom Tower in Jeddah, Saudi Arabia. Its height? 1000 metres. Taller however does not necessarily mean better. Neither does it necessarily mean prettier. To prove this, one only has to look at the proposed Changsha Tower in China, designed in a Brutalist style and reminiscent of the older Adventures of Superman with George Reeves. Thankfully, construction has stalled on that project. But now – buildings are set to take the next leap as another breakthrough in lift technology arrives. Otis, the largest lift manufacturer in the world (from the US) has been beaten to the punch by their rival Kone (Finnish) who has announced it has manufactured a system that can raise a lift up to 1000 metres, doubling the current design. Their development laboratory is actually is 333 metre deep mineshaft in Lohja and the new cable is made of carbon fibre instead of heavy steel. The weight of carbon fibre ropes (called for now the UltraRope) are 60% lighter (resulting in around a decrease in moving mass of 90% over longer distances) and have far greater tensile strength. The have a high friction coating, double the life span (also meaning less maintenance) and as a result of being lighter uses far less electricity. Tall buildings are designed to sway but with carbon fibre resonating at a different frequency to other building materials, it means tall buildings will sway less in high winds. This means that tall buildings will not need to be shut down as often in high winds. In theory, cables do not need to remain with buildings. In 1895 it was proposed to build a tower to geostationary orbit. Now space lifts are getting more attention and further development of carbon fibre could be the way using carbon nanotubes or boron nitride nanotubes which are even stronger for their weight. At the end of the cable would be a counterweight far into space. Competing forces of gravity on earth and centrifugal force from the spin of the earth would keep the cable under tension. Climber cars would then crawl up this tether into space. On other celestial bodies where gravity is weaker (such as the Moon or Mars) currently available Kevlar would be strong enough. All of this means taller buildings and perhaps the end of earth-constrained building. Either way, the term skyscraper may need to be re-named – to spacescraper. Where there’s a will, there’s a way, or more precisely prior to its translation “Yu Gong moves the mountains“. So it was said of a peasant named Yu Gong after he struggled to move two mountains that were blocking entrance to his home. 2 mountains – that’s nothing. Now China is planning to flatten 700 mountains and spend AU$3.6 billion in the process, to be orchestrated by the government of Lanzhou, a provincial capital in China’s arid northwest. The development, named the Lanzhou New Area of around 130,000 hectares, will house a new metropolis and in doing so is planning to increase the region’s GDP by AU$44 billion by 2030 according to the China Daily. The development was approved by China’s state council and will be its fifth state-level development zone and the first in its interior. The first stage of mountain demolition commenced already in October 2012. China’s home grown “Donald Trump” – Yan Jiehe heads one of China’s largest private companies – the Nanjing-based China Pacific Construction Group. He is known as an ultra-ambitious and talented pilot through the country’s “guanxi”, or personal connections. In 2006 the respected Hu Run report named Yan – then worth about AU$1.3 billion – as China’s second-richest man. This latest plan has received plenty of criticism as the site sits on the Yellow River, threatening more environmental concern and increasing its deadly silt level. Lanzhou is also home to 3.6 million people and they dubiously enjoy what the WHO regards as the worst air pollution in China. We guess metallurgy, chemical and fertilising production will do that. In fact experts have raised concerns about whether the project is environmentally viable. Gansu is an arid province, scoured by sandstorms and surrounded by deserts. The criticisms also includes the lack of water in the area and the financial risk of building a city in a desert – have we heard this before (Las Vegas)? The China Pacific Construction Group naturally dismiss these concerns and promise that their “protective style of development” will make things better than before. The new area “will lead to an environmentally sustainable economy based on energy-saving industries” including advanced equipment manufacturing, petrochemical industries and modern agriculture, wrote Chinese Central Television on its website. What do you think – incredible foresight, a waste of money, or needed development in an impoverished area? Let us know below. 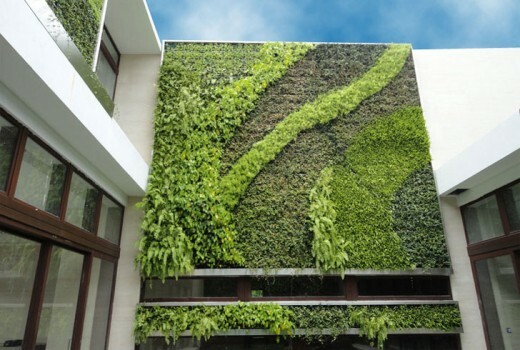 Green walls, or vertical gardens, are vertical faces of buildings or other structures that integrate vegetation to its surface either in whole or part. They are an interesting way to maximise greenery in tight urban spaces and has been often used in large projects as well as finding a home in smaller commercial projects. The greening process has certainly breathed a new aesthetic into buildings as varied as houses to work environments. And by “new” we mean new if that concept ignores the previous 2,600 years. One of the original 7 wonders of the world – the Hanging Gardens of Babylon – in 600 BC is the earliest known example of a green wall. 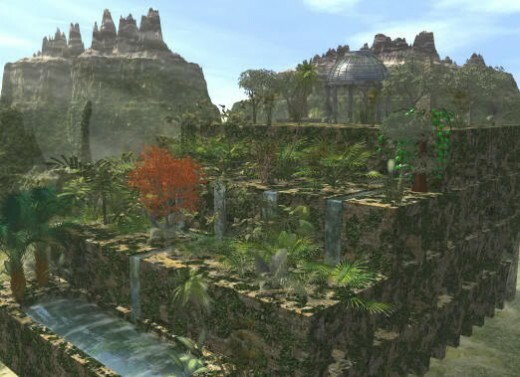 Today’s vertical gardens even use an irrigation concept similar to that of the then-King Nebuchadnezzar II. As far as can be ascertained, the modern version using hydroponics was invented by Stanley Hart White in 1938 and not being ‘un-capitalistic’ he even patented the original green wall! Green walls have been called vertical gardens, biowalls, or VCW V (vertical vegetated complex walls). Fundamentally though they are all the same thing. They are a way of maximising the sustainability of the planet and reducing the energy load on buildings. There are two main classes of vertical gardens: green façades and living walls. Green façades are made up of climbing plants either growing directly on a wall or on specially designed supporting structures. The plant shoot system grows up the side of the building while being rooted in the ground. A living wall is comprised with modular panels or containers, often of stainless steel, as well as geotextiles, irrigation systems, a growing medium and vegetation. 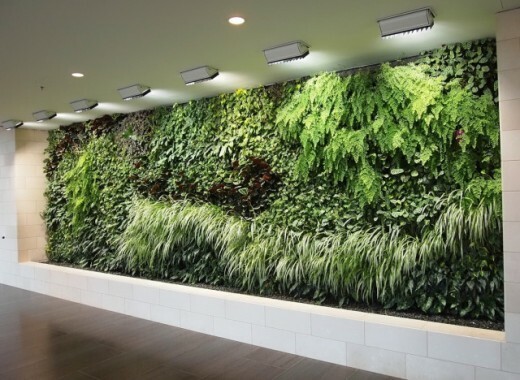 In offices and other commercial environments, for green wall to be installed successfully requires extensive irrigation systems. Sometimes they are attached to the air-return of the ventilation system to be used for air filtration. Vertical gardens are found most often in urban environments where the biowalls reduce the internal temperatures of buildings. Due to transpiration in plants, it is known that the surfaces of the walls do not rise more than around 5°C above the ambient temperature. For smaller green walls the plant containers are often re-purposed – items that had a previous life – such as milk bottles and cartons, rain gutters, wooden palettes, crates, even disposable styrofoam coffee cups can be used for the seedlings. Unlike the more traditional “recycling,” where materials are downgraded and then processed for reuse, up-cycling is converting both common and uncommon waste into new products of improved quality and environmental value. This act of repurposing has less impact on landfill. Plant size, type, and plant requirements growing in confined spaces. Greater varieties of plant species can be used aand adds more visual itnerest. Must be appropriate to the plant selection. Both the drainage and irrigation should be built-in and integrated with the containers and structure, plumbed up and must efficiently remove excess water. By reducing the runoff by capturing water from the irrigation system will improve the water efficiency of the vertical garden and minimise leaching into other plants below. Plants should be able to access water stored at the base of the container. This is critical – access must be made easy to insert new and remove old plants, rearrange plants, and to maintain the plants. In addition, maintenance will be required for the structure and drainage and irrigation lines. 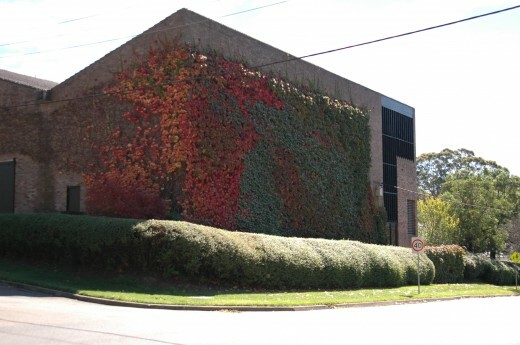 Sometimes green walls just appear over time – buildings covered in ivy but managed over time. Frensham in Mittagong in the Southern Highlands is just that. Vertical gardens have been designed for urban agriculture, urban gardening, because a wall can be made more attractive, and sometimes it is built indoors to help alleviate sick building syndrome. What do you think – would you like a green wall in your house or workplace? Let us know below.